More than 79 percent of elder abuse cases go unreported. Many tribes don’t have their own specialized elder protective service so there may not be anyone to report abuse to, or insufficient resources for a response even if a report was made. Additionally, many elders have experienced the impacts of past U.S. federal government policies and may fear further institutional abuse through contact with government agencies and authorities. 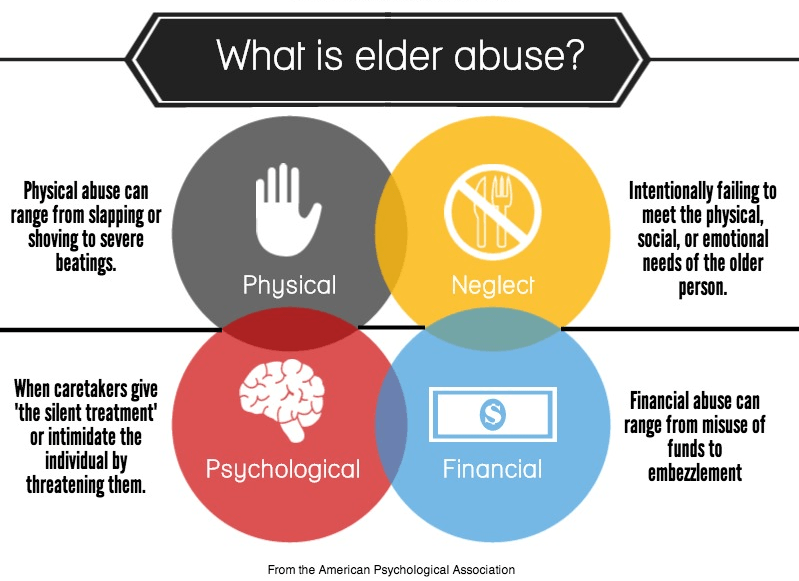 Nationally, neglect is the most frequent form of elder abuse. But emotional and psychological abuse, physical abuse, financial and material exploitation, and abandonment are also common. Native American elders may also experience spiritual abuse, such as being denied access to ceremonies or traditional healing. Many forms of abuse are interrelated and may be experienced simultaneously. Tribal social service providers estimate that nearly 80 percent of those abusing American Indian and Alaska Native elders are immediate family members and 10 percent are extended family members. Adult children are the most likely perpetrators. Spouses, other relatives, and grandchildren are also likely. Rates of abuse of American Indian and Alaska Native elders are highest in families where income levels are extremely low for the elder and for the abuser/caregiver. Caregiver unemployment also appears to be a risk factor for abuse in American Indian and Alaska Native communities. Abuse rates are also higher when the elder lives in the same home as the primary caregiver. In 88 percent of cases where the gender of the abuser was known, the victim was female and the perpetrator was male. Communities must explore the connection between domestic violence, sexual assault, stalking, and elder abuse. Creating comprehensive, victim-centered services can help prevent interpersonal violence in future generations. Adult Protective Services and tribal law enforcement should be notified immediately in cases where elder abuse is suspected. Call the 911 immediately if you or someone you know is in immediate, life-threatening danger. If the danger is not immediate, call the Eldercare Locator at 1-800-677-1116. Specially trained operators will refer you to a local agency for help. The Eldercare Locator is open Monday through Friday, 9 a.m. to 8 p.m. EST.